Throughout our year together, we’ve explored the concept of self-regulating our emotions, needs, and learning through a variety of large group, small group, and individual learning experiences. Self-Regulation and Well-Being, as one of our Four Frames of Learning in the Ontario Kindergarten Program, is regarded as a key component in our community that allows students to build an emerging emotional vocabulary and learn to make appropriate choices based off their energy states. 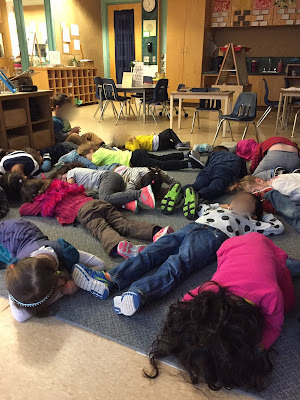 By providing students with prompts such as “listen to your body”, modelling appropriate strategies and naturally building in both high energy and low energy moments throughout our day, it is our hope that students find success in fulfilling the overall and specific expectations found within the Self-Regulation and Well-Being frame of the 2016 Kindergarten Program. In early January, we began having community discussions about the differences between feeling calm and feeling energized. Through these conversations, educators were careful not to label one energy state as “right” and the other as “wrong”, as we firmly believe there are moments throughout the day where calm energy is useful, but also moments when being energized helps! Sometimes “self-regulation” in the classroom can be misunderstood as encouraging students to be quiet, calm, and still at all times – while this has a time and a place, we also know that every child is different and sometimes they need opportunities to expel their high energy in safe and respectful ways (we do a lot of Dance Parties and outdoor experiences). We also wanted to honour the fact that it’s not exactly a clear dichotomy of being either calm or energized, but more often a whole range of energy states in between. 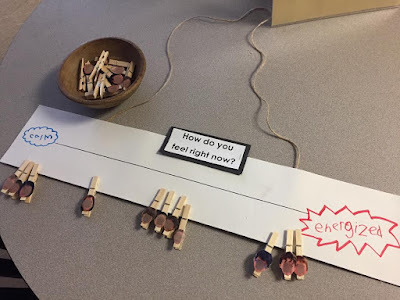 With this in mind, we considered the option of creating a visual representation that would help the class check in with themselves and articulate their current energy state. Knowing that the concepts we were exploring through this community inquiry are very abstract, we felt a visual element would help to make this more concrete and provide a developmentally appropriate experience for our emerging self-regulators. Our emerging Learning Goal was to build student autonomy in listening to their body and recognizing their current energy state. Analyzing the data that emerged from these knowledge building discussions was interesting – and lots of our prior learning, experience, and knowledge emerged. Students linked being calm to taking deep breaths, which is a strategy we have used all year. It was interesting to see students linking the concept of feeling energized to specific moments in their lives (i.e. 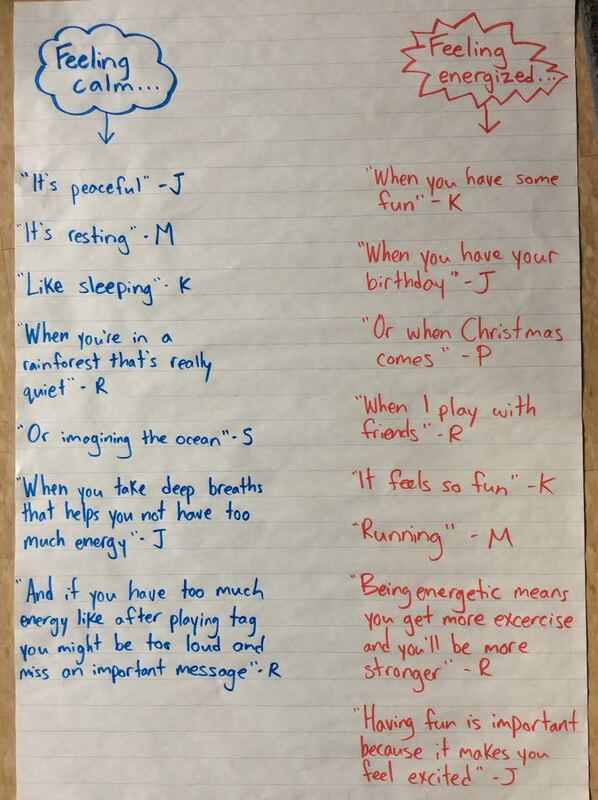 birthdays, Christmas) and to also have a student articulate that being energized is just as important as being calm. 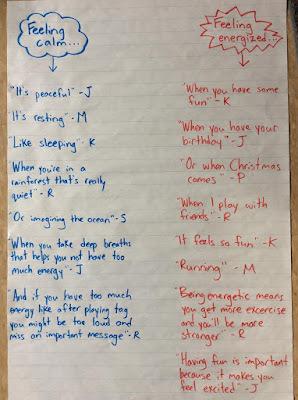 Through the next week, educators observed these concepts coming up naturally in student discussion and also connecting to various texts in our room (“Breathe”, “My Many Coloured Days”). Community discussions began to shift towards how our energy states link to certain parts of our day. Students demonstrated understanding that both energy states are important throughout the day – and often these energy states change as we transition through different moments of our day together. 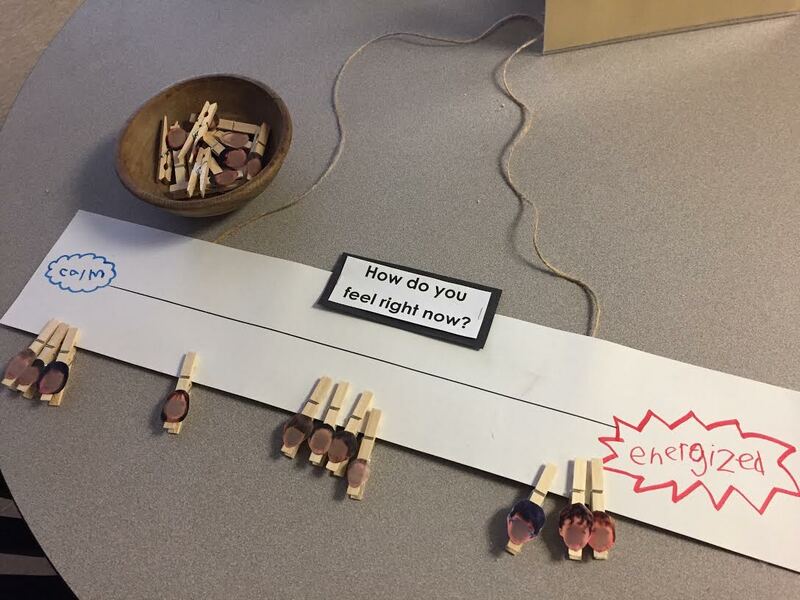 With sufficient front-loading, we felt it was time to create the visual line that would allow students to think about and represent their inner energy levels. With the help of a group of students we created a “sliding scale” of sorts – with calm on one end, and energized on the end. We created a clothespin with each student’s face and chose the question “How do you feel right now?” to honour that our energy states are in a constant state of flux throughout the transitions of our day. Checking in with themselves and their energy states has now become part of our daily routine. We’ve noticed many students choosing to add their clip to the line at the very start of the day, but also revisiting the line many times to change their representation. Often after Gym class many students move it to energized, and we practice taking deep breaths and visualizing a place that is quiet, calm, and safe to bring our energy levels down. 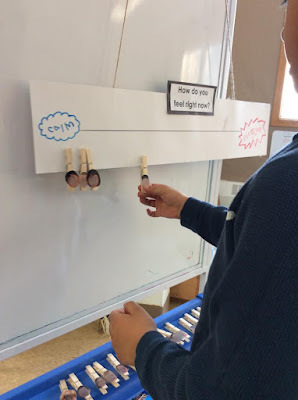 Other strategies that students recall from previous learning this year and have been self-selecting when it’s time to bring our energy down are using the rainstick sound or using our class sparkle jar. What’s next? As the cycle of Inquiry continues and students continue to construct and reform their knowledge on the concepts of differing energy states and when they are more appropriate throughout our day, we as an educator team are considering where this can take us. 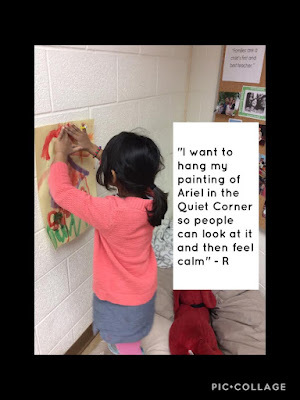 One idea we are exploring is using the scenes that students have shared through our “quiet, calm, and safe” visualization exercise and connecting it to a project at our Art Studio – where these landscapes will come to life. We also want to continue the concept of “being energized” and ensuring that it is not seen as a negative, but just a feeling that we all experience throughout the day. Recently students have been more attune to the energy states in the room (J: “It’s loud. I think we need a Dance Party now!”). We have also discussed a redesign of our Quiet Corner using our students’ unique ideas to co-create a more calming space for our class. We have started with the question “What makes YOU feel calm?” with the understanding that we’ve always selected the tools for calming down. We are curious to learn if our ideas align with theirs! Thanks for great tips to get more and more knowledge about day care centre.